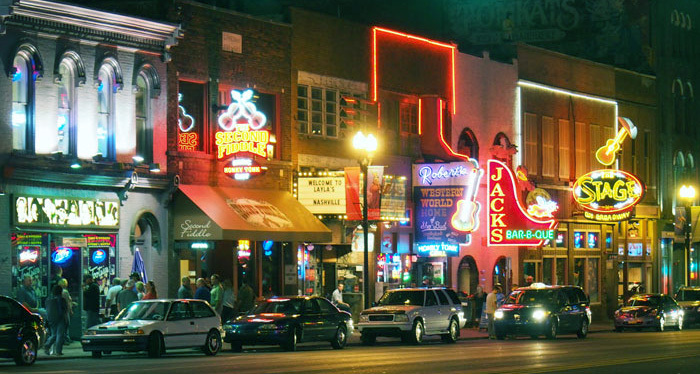 Lower Broadway or “Lower Broad” is Nashville’s popular entertainment district showcasing some of the city’s most talented musicians who play for tips only. Lower Broadway will also be an ongoing investment series where I attempt to generate passive income through aggressively saving a large portion of my average salary. Ready for my big secret? There really wasn’t a whole lot of strategy involved when I transferred my Roth IRA from Fidelity to Vanguard and purchased index funds last summer. I had been holding my money in a Fidelity Freedom target date mutual fund for a few years, but knew that Vanguard index funds were significantly cheaper, so I impulsively made the switch. Once I moved the money, I wasn’t sure what to do next, so I looked at the holdings of the Vanguard Target Retirement 2050 Fund (VFIFX) and allocated my money into the two largest funds (VTSAX and VTIAX) in their portfolio. Purchasing the funds individually would be cheaper over the lifetime of the account, and would force me to rebalance annually as I grew older. I skipped the bond fund mainly due to my age (29) and my high risk tolerance. Overall, I have been been satisfied with the performances of VTSAX and VTIAX, and feel really good about their expense ratios (.05% and .16%, respectively). Since I’ve already made the maximum Roth IRA contribution for 2014, I should really just sit back, relax, and stop obsessively checking the cost basis for these funds! What I’m feeling slightly insecure about is my taxable investment account. Currently, I’m 100% invested in Vanguard 500 Index Fund Investor Shares (VFINX). While this is only 33.391 shares, I’m planning to contribute another $17,300 over the course of this year and this month’s contribution will be larger than usual ($1,458 monthly contribution + $1,250 tax return = $2,708). I need to think more strategically and diversify a bit. I’m not ready for ETFs and I’m still not motivated by bonds. My dividends and capitol gains are not longer being automatically reinvested so I can use those to help rebalance, as well. My long term goal is to generate enough passive income to retire early, however, I need to keep my strategy low maintenance while I am still building skills for my career. For this reason, I’m sticking with index funds rather than buying individual stocks for now. Readers: What does your portfolio look like? What do you think of my choices? Your choices look reasonable and the low expenses are key. You can’t really go wrong with a company like Vanguard. Quick question, When you state, “My long term goal is to generate enough passive income to retire early….” do you really mean “portfolio” income? I’d like to generate a decent stream of passive income through my taxable account. I’m not entirely sure what my definition of “early retirement” is yet, but I’m only 29. My Roth IRA money will be extra. Thanks for your comments! Can I ask why you say you are not ready for ETFs? When it comes to index funds, there is not all that much difference between mutual funds and ETFs. I believe mutual funds are generally a little less tax efficient, but with index funds the difference is usually minimal. For instance, the ETF counterpart (VOO) to VFINX has an expense ratio of .05% compared to .17%. Great question! Honestly, I just don’t know enough about them to start buying them. So, ETFs tend to be even cheaper than index funds? Yes, ETFs don’t have all the fees associated with mutual funds as they are generally designed to track indexes. Check out VOO, it’s the same composition as VFINX but cheaper. I made a switch earlier this year to VOO from VFINX in my taxable account. I definitely will. Thanks for the tip! It seems to be the general consensus that VTSMX is a solid fund. I’m definitely going to keep 60% of my Roth IRA money there for a long time. Thanks for sharing! I think that was a smart move- I actually did the same thing, buying some of the major holdings of the target date funds but in an index to take advantage of the lower expense ratio. Since you’re going to contribute such a large amount to a taxable account, can I ask if there are any other ways you could contribute the same sum, but to a tax-advantaged account? Anything to pay less to Uncle Sam. I’m not sure about lowering my taxable income. Any ideas? I have no 401(k), pension, or HSA. I’m considering opening a 529 account to save for some education expenses, but I’m not sure what my other options are.